The PDP-11 is perhaps the most important computer in history. This was the king of all minicomputers, and once you get past the amazing front panels of the 11/20, 11/40, and 11/70, you’ll find PDP-11s everywhere. Heathkit sold one. It was the smallest computer that could run Unix. There were desktop versions sold as DEC Professionals. I have been told Ticketmaster — the entire backend of all event ticket sales in the United States — still runs on PDP-11s. One of the interesting bits of the PDP-11 is the miniaturization that happened over the course of its development. Over time, the Unibus processor cards of the earlier models were shrunk down into a single chip. This PDP-on-a-chip was then cloned by the Soviets, and like most vintage Eastern European electronics, they’re all readily available on eBay. For his Hackaday Prize entry, [SHAOS] is taking one of these chips and turning it into a modern machine. The PDPii is a project to bring the PDP-11 back to life in the form of an Open Source motherboard with a Mini-ITX motherboard. Is it game-changing? No, not really; you could buy a desktop PDP-11 thirty years ago. This project, though, is taking new old stock chips you can buy for ten dollars and turning it into something resembling a modern system. Finally, Ticketmaster can upgrade. The design of this project doesn’t quite meet the spec for the Mini-ITX form factor; it’s based off the RC2014 backplane Z80 computer, but desktop computer cases are cheap, as are power supplies, and I’m sure someone out there knows how to fit an eight inch floppy in a five and a quarter inch hole. The key feature for this Mini-ITX backplane PDP-11 is a redesign of the Q-bus found in later PDPs to something that’s a bit smaller, a bit cheaper to manufacture, and still has all the relevant pins accessible. With some reconfiguring of the baroque DEC standards, [SHAOS] came up with the Bread-Board Friendly Q-bus Extended, or BBQ-Bus+. The next step for this project is gathering up a few PDP-11 compatible Russian КР1801ВМ2 CPUs and going to town on the architecture of what is probably the most replicated computer design ever. I love the old retro computer rebuilds, a while ago I built my own retrobsd pic32 board, Unix running on less than half a credit card size with an 8Gb SD card to boot. We need more of these retro builds in kit form for the younger generation to learn about real computers! Surely Ticketmaster is running a PDP-11 emulator by now and not relying on ancient hardware. I didn’t see what software he has. I ran RT-11 as my OS when I was a teenager up to no good. About the only software that I had that I didn’t write for myself in BASIC was Zork. I wonder what you can find for a PDP-11 now? There are some GE nuclear power plants still using PDP-11s running RT-11 for control of the fuel handling robots, and they will continue until 2050. 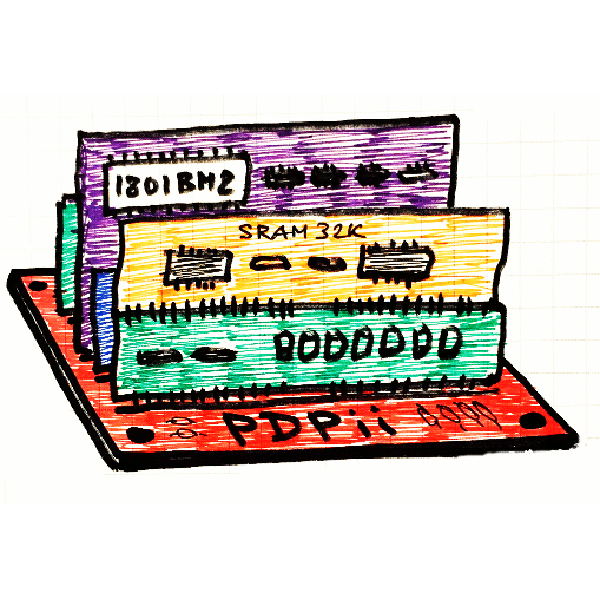 Looking at the architecture, the msp430 series of microcontroller from TI are in basically pdp11s. A brief web search shows that, indeed, Ticketmaster has been dragging along their old hand-written assembly PDP-11 code on emulators and that as of 2017 it was running on an emulator in an AWS container. That it hasn’t been completely replaced by something else is scary *and* impressive. There was a single-chip PDP-11 – the T-11. It had no memory management so could only address 64Kb (32 KW) of memory. It was used in the Falcon SBC-11/21 single board computer (see http://bitsavers.org/pdf/dec/pdp11/1121/EK-KXT11-UG-PR1.pdf) and was used internally in a number of products. My box of bits has several T-11 chips in it. I’m afraid I really don’t know. Your best bet is to find a DEC board that used the chip. An M7676 is currently on eBay with a buy it now asking price of $595. Mineu uses a 6522 for IO – combining the best parts of the Apple II and the PDP11. > THe Soviets cloned it as the 1802. Yes, KP1801BM2 was a nice DIP40 processor which worked really well and had a simple QBUS which was ready for connection to peripherals. I still have a couple as a memory. One can probably build the entire computer with a Spartan FPGA and this processor. It has a whooping 64kB RAM which now can be implemented inside FPGA… By the way, does anyone has a FOCAL interpreter or Pascal for RT11 OS? This is kinda cool and worth following for me. A lot of people learned “machine code” in classes that used the 11/70 and the Vax. Everyone should know the pain (just once) of doing big things with slow computers. The motherboard version of the chips was sold for education with DEC’s small cartridge tape drive. Boot took 40 minutes to infinity depending on errors. Debugging meant assistance from DEC, who set the standard for abominable customer support. Even for very big customers. IIRC, An Apple IIe with an 8 or 10 MHz accelerator can beat a VAX MIPS. I suppose the real usefulness came from the memory mapped I/O and DMA. You can’t get any faster than that. Imagine a college with a PDP-11/70 as a mainframe and 64 or more terminals connected by current loop all over campus. Students are writing BASIC and FORTRAN IV programs and saving to their accounts or debugging. The Administration is using it for the alumni address data base and many other things. Faculty are running bigger programs. It helps that the terminals are mostly Decwriters at 300 baud and a few of the VT100 at 1200 baud. All the jobs are running in less than 32K words and being swapped to a huge disk drive. Virtual memory allows some sort of paging scheme if you have more RAM – likely as not, magnetic core. All this on a 16 bit computer running at 3 instructions per microsecond to one instruction in 3.5 microseconds, er, that’s about 0.3 MIPS to 3.3 MIPS depending on cached data. I think polyForth will run bare metal on this system as its own OS. Some benchmarks against an Arduino Uno at 8MHz and 16 MHz would be lovely. Compiling my Pascal or FORTRAN code ran overnight and I could pickup a printout the next morning. This is is all well and good. But what about exposing a source? Where are these T11 parts found? Not eBay, that is one source I do not consider a valid one. I saw what you did there BB, stop feeding those 2 million tribbles still in that closet of yours in back of you. And the J-11 sources. No (*****) eBay auctions please. Ah, old memories. As a gray-beard, I recall writing drivers for an 11/34 unibus IEEE-488 I/O card. The unibus has a hardware FUBAR register, “Failed Unibus Address Register”… and you thought that meant something else. Oops, my bad… while we had 11/34’s, the FUBAR register was a VAX entity I think. I’ll have to dust off the hardware handbooks. (Waving a $10 bill in the air) Where can I find these “new old stock chips (I) can buy for ten dollars”? I’m not finding any on ebay…. > I have been told Ticketmaster — the entire backend of all event ticket sales in the United States — still runs on PDP-11s.